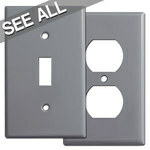 Tranquil and traditional, these medium gray switchplates are an excellent choice in homes or offices with neutral furnishings. 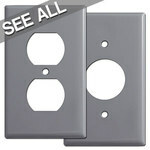 Our electrical gray light switch covers come in over fifty sizes including grey Decora rocker, standard toggle and ground fault wall plates in both standard and jumbo sizes, plus specialty layouts and other hard-to-find configurations that usually are not found in gray. 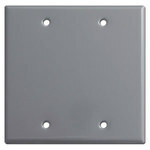 These gray semi-gloss enamel switch plates are a sturdy .030" steel. UL listed and made in USA. Will these grey plates be an exact match to my devices? Electrical devices are made in plastic. These gray plates are made of metal which makes them more attractive and durable than inexpensive gray plates that tend to crack or discolor over time. Since the plates and devices are made of different materials, the colors aren’t an exact match but are similar and still look good. Note that gray device color is also affected by the surface finish - gloss vs. matte / satin. If you have a variety of devices types (such as dimmers, outlets and switches) in a single plate, you'll most likely end up with slightly varying finishes - this is just unavoidable but won't be all that noticeable once installed and put to use. 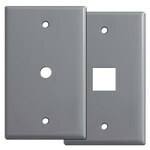 These gray light switch covers look great but are they durable? Featuring American-made quality, these versatile grey switchplates are made from durable .030" steel with a smooth, semi-gloss baked powder-paint enamel finish that looks great with either gloss or satin gray light switches and electrical outlets. And with so many sizes, you'll find it's easy to complete your lighting project. 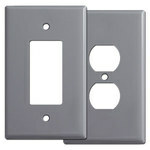 What decorating styles would these gray switch plate covers be most suitable for? Gray switch plates are a great alternative for anyone who doesn't want to go with the very modern and industrial looking satin stainless steel wallplates. 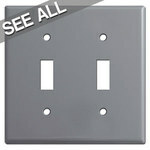 They are also a great fit for customers who are concerned about matching their electrical devices to their cover plates. We offer matching gray electrical devices to compliment light switch plates installed in homes decorated in Scandinavian, Coastal, Nautical and Modern styles. If I purchase gray light switch covers for my home office should I just go ahead and get them for the entire house? Many customers like the look of matching wallplates in each room, however you do not have to purchase them for your whole house. 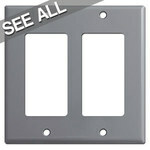 Gray metal switch plates look great in mud rooms, laundry rooms, living rooms, offices, kitchens and garages. Where are grey outlet covers primarily used? Our gray finish light switch covers are a favorite choice for gyms and health clubs, showrooms, luxury car auto body shops and graphic design studios. 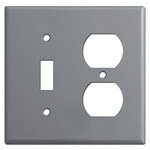 Will gray switch plates go with other gray electrical supplies? We've found that there are slight differences in the shades of gray devices manufactured by the major electrical supply companies with some being a lighter, cooler shade of gray and others being a slightly darker, warmer shade. These differences are slight and typically not something your eye would be drawn to after installation. I have a very light gray wallpaper in my foyer which I recently installed and now need new switch covers. I know that some people recover their switchplates with the same wallpaper that they use on their walls but this seems extremely painstaking and I'm not the best artist. Are there any particular shades of gray that your finish matches the best? We have found that our gray finish is best paired with the lighter varieties of gray. This includes paint colors in the gray family, white family and even blue family. When it comes to gray, our switch plates look great on walls that have been painted in the following colors: Zircon, Gray Clouds, Repose Gray, Front Porch or Aloof Gray.